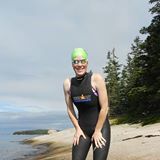 Jennifer Haines grew up an Air Force brat with swimming as the one constant that never changed with every move. USA competitive swimming began at the age of nine and continued through PAC-10 (now PAC-12) swimming and then to open water swimming as a life long endeavor. She coached with Parkland Area Aquatic Club in Allentown, PA before moving up to New Hampshire. Her first dip in the NH coaching scene began with NCAC. She spent the summer of 2008 coaching at the Longhorns Swim Camp and then returned to the NH scene when the new UVAC facility opened. Jennifer has been involved with UVAC since 2009 as a volunteer coach with all age groups. In addition to coaching and parenting, Jennifer teaches 8th grade English at a local middle school. If she isn’t in the classroom or on deck, she can be found adventuring on land and water with her family.